I have something special for you today. 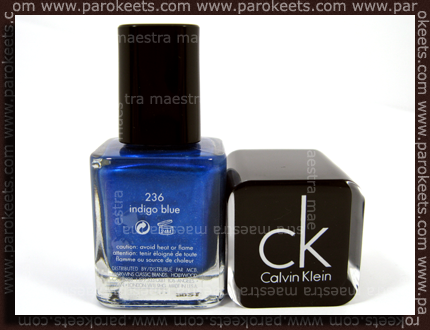 I’ll show the only two Calvin Klein nail polishes I own. And both are special, because they are limited edition and I beyond lucky to get them. I’m mean, unbelievably lucky! Both are from the same collection of three colors (the third one was silver) and I think they were released as part of Spring 2009 collection, but I’m not sure. I’ll show you the pictures first and then I’ll tell a funny story about how I got them. Indigo Blue is gorgeous metallic blue. I wouldn’t classify it as indigo blue. I’d say it’s more medium blue and very vivid. The application was flawless. OK, the brush is crap. It’s like a mop. And I couldn’t really control it. But the consistency was great. Very pigmented and a bit on the thick side, but I prefer thick over watery. And for a metallic shade it’s a dream to apply and no visible brush strokes at all. They just disappear when the polish dries. Next one is Emerald Green. A wonderful forest green. Again the brush was crap, but the formula was great. Two coats in the picture. If I’d apply three coats, the color would be a bit deeper. I don’t have a lot to say about Emerald Green. Great color and I love it! 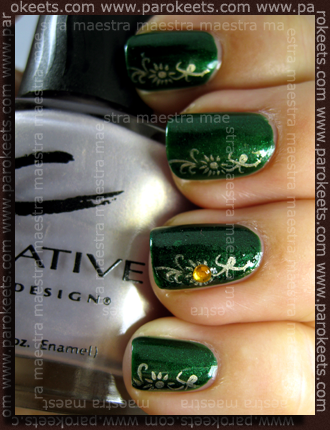 I added subtle Chez-Delaney design with P30 and CND – Eskimo Kiss. It’s my KOTD. Oh, yes. I have a story to tell. Well, I first saw this collection in Austria. 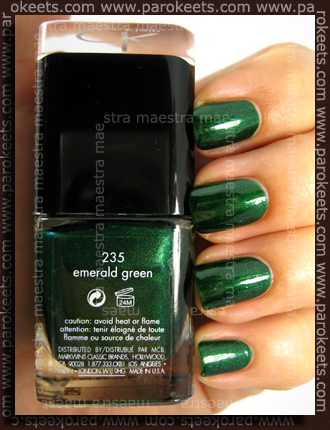 I was instantly in love with Emerald Green, but they only had a tester bottle. OK, then I checked in all our stores, that sell Calvin Klein cosmetics but no luck. They never received this collection. I was sad, as I knew I would never get my hands on my beloved Emerald Green, because I knew it was a limited edition color. Then I slowly forgot about it. Then, a month ago, I went to Germany, where I again saw this collection, but as luck would have it they also only had a tester bottle. I managed to find one new Indigo Blue bottle hidden somewhere behind the drawer, but no Emerald Green. I grabbed the Indigo Blue, but that was not the end of it. It was on sale! I think I got it for half of the original price. How cool is that! I still couldn’t get Emerald Green out of my mind, so I went back the next day and asked a very friendly seller, if I could buy the tester bottle of Emerald Green. I checked before and the tester bottle was almost full and in good shape, but she said that they aren’t allowed to sell tester bottles. Oh my … I threw a very sad look and explained to her that I collect polishes and I really need to have that one and that she would make me really happy and so … She gave in and asked her boss, what to do. At the end I got my Emerald Green bottle. And you know what? It was free!!! I mean, I couldn’t believe it. I was beyond happy and I could cry for joy! That’s my story today. Do you have any funny stories about your polishes? that is totally awesome that you got the Emerald green for free!!! WOW! 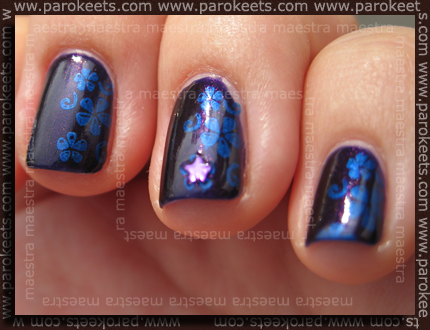 These are both beautiful polishes, but I love the way you used the blue one for Konading, it was so pretty! wow!!! u’re such a lucky girl!! 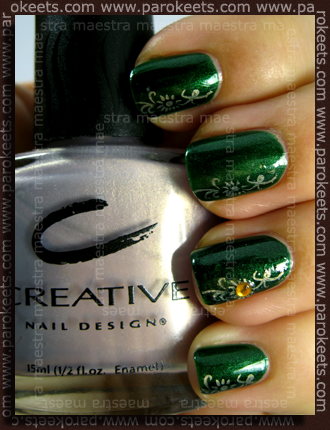 and thats a great story..i love that emerald green.. and already told myself not to fall inlove with the polish coz its discontinued :silly: and i have my all access on the way.. :wub: what plate u used in ur indigo design? they’ve discontinued the ck cosmetics line- i was lucky to grab some of their treatments- a top coat, a base coat, a strenghtening base coat and a (cuticle) moisturerizer and a sheer one for layering…. 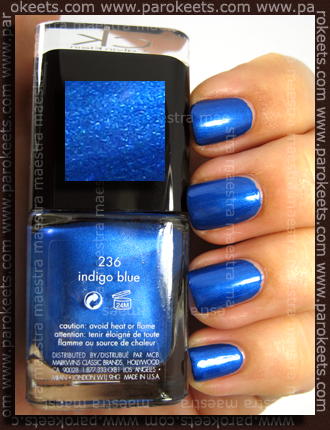 too bad I’ve discovered them now when they’ve discontinued their line because I’d love to have indigo blue…. It’s really too bad, that they would discontinue such a great line. I grabbed two polishes and three creme eyeshadows. Yay!!! Curious thing is that I haven’t seen those colors in France (we’re always a bit late when it comes to nail polish, I swear). I would have picked the green otherwise. All I know is that Calvin Klein stop doing make up (at least in my country). Not sure about other countries but what a shame, I loved the brand. CK is discontinued here in Slovenia, in Austria and also in Germany. So I think they stopped doing cosmetics… What a shame! Oh what a great story and beautiful colors! Tudi meni sta oba krasna. Oba sta lepa, zelenko pa sploh. :wub: Res prijazna prodajalka, ki ti je uslišala željo. ooo krasno! prečudovit lakec, res vreden truda! Uaaau, katera prijazna prodajalka, kapo dol, resnicno! Moder je krasen, samo ga ne bi opredelila kakor indigo moder (pod indigo barvo si predstavljam temno modro, mogoce z dodatkom vijolicne, boh? ).